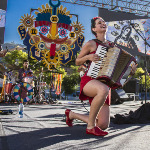 Accordion-wielding Chilean songstress Pascuala Ilabaca continues her irrepressible charm offensive, captivating audiences around the globe with abundant positive energy, skillful musicianship and a profusion of memorable songs. Accompanied by her formidable band Fauna, her unique stage presence conjures up sweetness and empowerment at the same time, setting her songs alive with both fragility and verve. A foremost figure on the new scene of young Chilean singer-songwriters, her music is rooted in traditional sounds but effortlessly integrates shades of jazz, pop and rock, alongside influences gathered on her travels to India and Mexico. 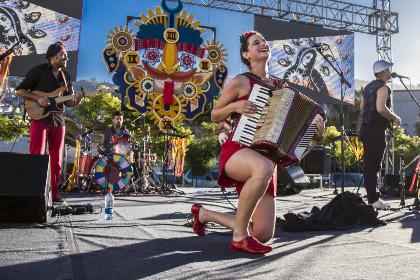 Socially engaged, her compositions touch on political as well as romantic and celebratory themes and her repertoire includes interpretations of Victor Jara and Violetta Parra songs, evincing her affinity with the spirit of the Nueva Cancion Chilena movement. Chilean folk roots going forward!